Anyone here ride Bicycles? If so, what kind and what you got? Just recently got some cheapo 700c Comfort bike from Walmart also. 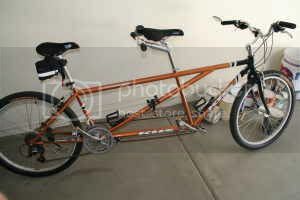 Looking forward to get a road bike or a tandem during Christmas though. I personally love vintage road bikes, I used to have a Schwinn Spirit, but I now ride a Schwinn Varsity. I'm waiting for a really nice vintage cruiser to pop up at a garage sale or craigslist. My boyfriend rides a really nice 60's Gitane Track bike, we recently had it restored but the dang original parts were really hard to find! I had a Varsity that I restored and then sold. I now have a Bridgestone RB-T, yea, I'm a BOB. Like this, but sportin' Look clips and a Brooks saddle. I have a Marin Kentfield Hybrid bike, along with a cheap road bike. Currently saving up funds to get my Trek 2.3, oh i can't wait! Last edited by RedBikeGirl on Thu Jul 24, 2008 5:53 am, edited 1 time in total. I have several bikes as collectors items, including a Schwinn Orange Krate, a Schwinn base model Stingray, and a Schwinn Rams Horn Fastback. I also have a Schwinn Varsity, and a Huffy Sportsman with a Sturmey Archer 3 speed. These are all hanging on the wall. All are from the late '60s/early '70s. No Chinese Junk. The only bike I actually ride, is a 3 year old Haro V3 mountain bike, with street tires, raised bars, a wider saddle (much wider) with a suspension seatpost. It also has $50 Primo Super Tenderizer BMX pedals on it. I do not believe in clipless pedals, I do not wear spandex, and I do not wear a helmet. I just get on my bike and ride, just like I did when I was a kid. I have severe arthritis and fibromyalgia, and can no longer do any mountain biking, and I cannot ride a regular road bike, because the saddle is to narrow, and the bars are to low. I had a Sun EZ1 Super Cruiser recumbent, which was comfortable, but almost impossible to maneuver around town, it was like 7' long. So I sold it, and rigged up my mountain bike for street use. I have been considering the possibility of getting a cruiser. 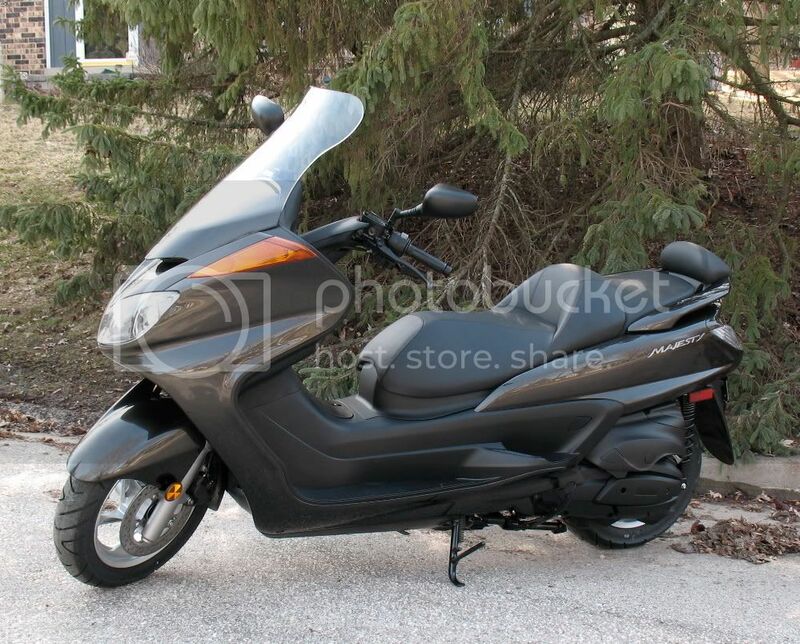 In AZ, bike riding season is in the winter, just like scooter and motorcycle riding season, except strictly for transportation, and I am not going to pedal a bike for transportation in 115 degree heat, when I have scooters. Jerry. vulcan wrote: I am not going to pedal a bike for transportation in 115 degree heat, when I have scooters. Yup, used to ride and race mtn bikes all the time. Here was my last downhill race bike. On my Nicolai hardtail bike. Also have a Devinci Roadbike. You guys have nice bikes! I found a slightly used (like new) KHS tandem locally for $500. Supposedly, it retails for $1200 or so. It has shimano, oversized tubing..etc. Do you guys think it's a good deal? Sounds like a great deal. 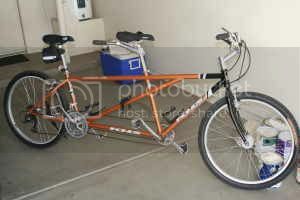 Although I have to admit, I never really understood tandems. When I ride a bike, I like to ride alone, or if riding with someone else, use 2 seperate bikes. But they are very popular around here, so there must be something about them I'm missing. I like the bars on that one, I simply cannot bend over far enough to use traditional roadbike bars. I had to raise the bars on my mountain bike turned road bike about 4" before I could ride it without severe pain. Jerry. I just spent some of my "Stimulation Package" money and bought myself a new Giant Cypress. It's part of their comfort series. Its sits upright like a scooter and has a suspension seat and front fork suspension. I like it. MGA531 wrote: I just spent some of my "Stimulation Package" money and bought myself a new Giant Cypress. It's part of their comfort series. Its sits upright like a scooter and has a suspension seat and front fork suspension. I like it. ooh...how do you like the upright riding position? I've seen some new bike at the Kozy's over here but of course I can't recall the brand or model name...but they basically advertise the upright seating and cruiser style for comfort. I ride a road bike, and have to lean quite a bit (because I'm short) to reach the curved handlebars. I like it. I think its less stress on the back and neck. Why ride hunched over so your neck has to be "up" to see? It just feels natural. Its billed as being for the "bike path". That would be true. I don't ride over mountains and I don't race. So, a comfort bike is perfect for me. There are identical models from Trek, but the Giant was a bit cheaper. I wanted blue but the factory was sold out for the year. I'm not that short, but have a small inseam, so I had to get the small frame. Its still a bit of a stretch to get up on it, but feels good when I'm riding. Its got those big, over-inflated, 700 slime-filled tires too.